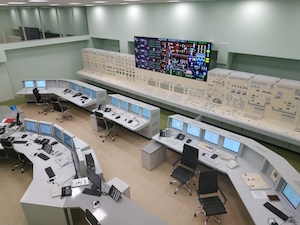 Russia’s Beloyarsk nuclear plant announced on 29 March that it has completed installation of a full-scale BN-800 simulator for unit 4 of the plant. It is expected to come online at the end of 2019. Nuclear utility Rosnergoatom said operating personnel at the Beloyarsk 4 plant will undergo training for 144 hours a year, of which 80 hours will be on the simulator. The developer of the simulator was the Russian Scientific & Research Institute for Nuclear Power Plant Operation (VNIIAES), and the equipment was manufactured by the Ural Electromechanical Plant and software company ENIKO TSO. The full-scale simulator replaces a the software model also allows reliable simulation of the response of systems and mechanisms to the actions of operators. In addition to the BN-800 full-scale simulator, a simulator was installed in the training centre for the personnel of other workshops and departments. The Beloyarsk nuclear plant started operation in 1964. Units 1 and 2 - AMB-100 and AMB-200 thermal neutron reactors – have been closed for decommissioning. Beloyarsk 3, with a BN-600 fast neutron reactor began operation in 1980 and Beloyarsk 4 with a BN-800 fast reactor starting up in 2015.